Book Jacket Synopsis: It is very hard for a sighted person to imagine what it is like to be blind. This groundbreaking, award-winning book endeavors to convey the experience of a person who can only see through his or her sense of touch, taste, smell or hearing. 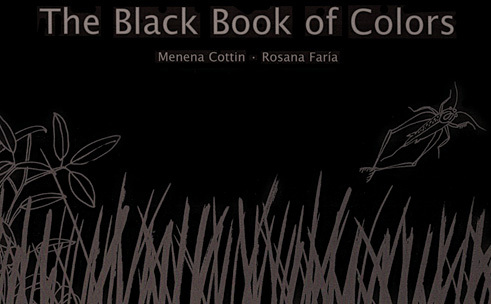 Why I like this book: Menena Cottin and Rosana Faria’s have teamed up to create an extraordinary book for sighted children to help them experience what it is like to be blind and depend upon their senses. The entire book is on black paper. The pages on the left have white text at the bottom where Thomas describes a color using his senses and beautiful imagery. 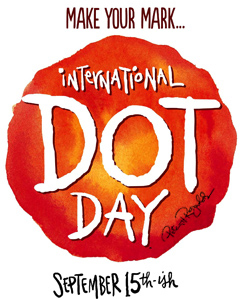 There is Braille at the top of the page which helps a sighted child to imagine what it is like to read by touch. On the corresponding pages the illustrations are elegant and delicate raised black line drawings which are meant to be revealed by the touch of finger tips. This book is a masterpiece that teaches children how to describe colors by using all of their senses. The book is not intended for visually impaired children. Resources: I would use this book to discuss visual impairments. The book alone is a resource. It asks readers to be blind. It a remarkable way for children to experience the world through touch, smell, taste and sound. At the end of the book is a raised braille alphabet. 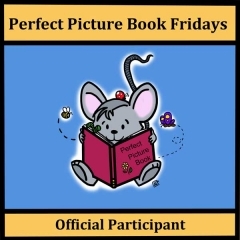 Activity: Create a class book of colors and ask children to draw a picture of something that represents a color and write a sense that corresponds to their picture. Synopsis: At school, everything seems to be going wrong for Erik. In soccer, he kicks the ball to the wrong team. In class he messes up his reading homework and misses half the math problems written on the board. 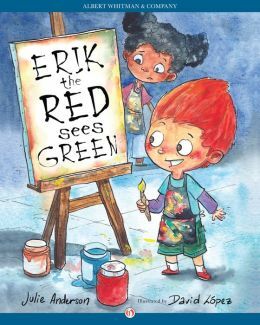 Erik is teased in art class when he draws a self-portrait and paints his own hair green. A trip to the doctor confirmed that Erik’s painting isn’t wrong — he is color blind. What a like about this book: Julie Anderson’s book is an uplifting story about a strong and self-confident boy who seems to do everything wrong, but doesn’t know why. Once he understands his visual issues, he takes charge and talks to his class about his color blindness and invites them to ask questions. Erik sees colors, but just differently. 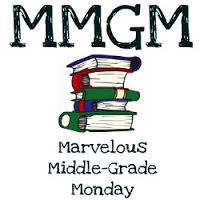 He says, “I like to think I am color vision quirky!” Because his color deficiency is diagnosed, his teacher makes black-and-white copies of math assignments. His parents and friends jump in with other solutions to help Erik in a positive way. This is an excellent story about everyone working together to help Erik. Even young children will understand the language. David Lopez’s illustrations are colorful and create a happy atmosphere for Erik. Resources: The author has included a double-page spread of information about color vision deficiency. 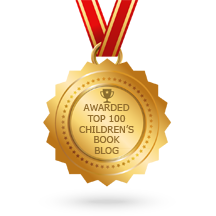 The book is a great resource for parents, teachers and children. Visit the Color Blind Awareness website, where you can actually experience color deficiency and learn about why it effects more men then women. Book Jacket Synopsis: When Cally Fisher says she sees her dead mother, no one believers her. The only other living soul who sees Cally’s mom is a mysterious wolfhound who always seems to be there when her mom appears. And when Cally stops talking — what’s the point if no one is listening — how will she convince anyone that her mom is still with them or persuade her dad that the huge silver-gray dog is their last link with her. 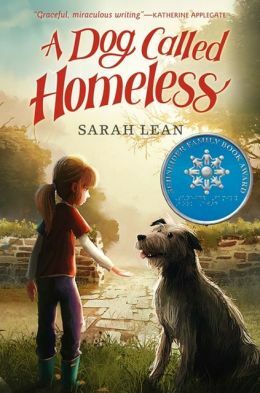 Why I like this book: Sarah Lean has written a very sensitive and moving story about a girl dealing with the death of her mother. 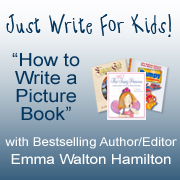 She writes with a very clear, natural and empathetic voice. Her story is about hope, friendship, determination and courage. Her plot is strong with an unexpected twist at the end. Lean does an outstanding job of developing the heart and soul of her characters. When Cally stops talking for 31 days, this determined girl has her reasons. She wants to remember and talk about her mother, who died in a car accident. But her father wants to forget and move on. Cally makes herself heard through her silence in a very unusual way. Dog lovers will cheer for the wolfhound Homeless, who is very loveable. This is a beautiful story for any child who has lost a loved one. You may visit Sarah Lean at her website. Book Synopsis: Jacob is in a hurry — a really big hurry — to get to the store and buy the toy he’s always wanted. Along the way, people keep slowing him down to ask him questions about his eye patch. It’s natural to have questions when some one looks different…but do they have to ask right now? Why I love this book: I wore an eye patch as a child and I love sharing this upbeat and winning book! Beth Kobliner Shaw co-authored the book with her nine-year-old son, Jacob. 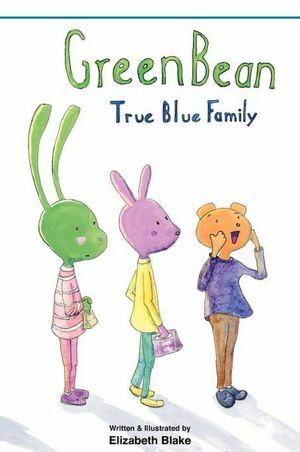 They wrote a charming, funny and encouraging story to show that every one has something that makes them unique. This will be a welcomed and very helpful book for the many children who wear eye patches to strengthen an eye. You have to admire Jacob’s courage and strength as he’s not going to let his eye patch get in his way of getting to the science store before it closes. Yes, Jacob understands people are curious about why he’s wearing and eye patch, and normally he doesn’t mind answering their questions. But he’s on a mission and there are too many amusing obstacles that get in his way. You’ll find yourself cheering for Jacob! Jules Feiffer’s illustrations are lively and bold. The artwork is done in pen and watercolor and convey Jacob’s urgency and frustration to get to the store! 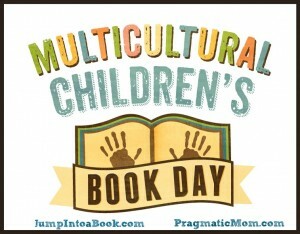 It is an excellent book to use with kids to teach them about differences. 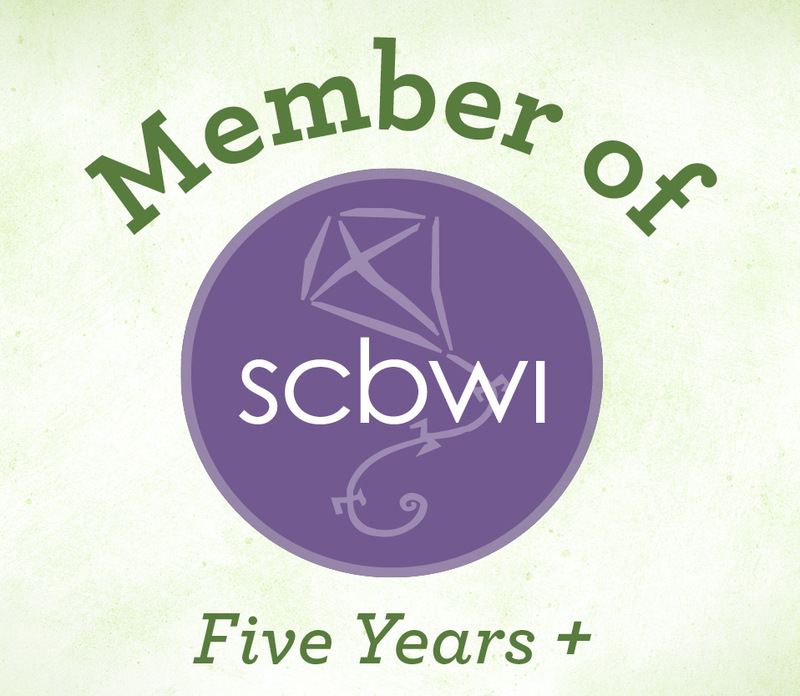 A special thank you to my friend and colleague, Beth Stilborn, who writes the blog By Word of Beth. She recommended this book to me for review. Resources: There are author notes at the end from Beth and Jacob. 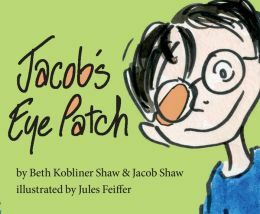 For more fun, visit the Jacob’s Eye Patch link where you can find resources, an activity kit and tip sheet . Opening/Synopsis: “Helen gurgled and giggled in her crib. At six months, she crawled and said, ‘How-d’ye,’ and ‘wah-wah’ for water. When she was one, she ran after a ray of sunshine. She loved the mockingbird’s song and the sweet smell of climbing roses. But best of all was being on her father’s lap and in her mother’s arms.” When Helen was 19 months old, an illness took away her sight and speech. She was surrounded by silence and darkness. Helen tried to make up signs to communicate with her parents. But her failure to make them understand turned into outbursts. Annie Sullivan came to work with Helen when she was seven years old. Helen learned sign language quickly and was considered a genius. Annie taught her Braille so she could read books. She learned to write with a pencil, read lips, speak, and to experience the world with enthusiasm. Helen graduated from college with honors. Helen’s journey out of darkness led to freedom and she taught people how very large her world was. Why I like this book: The title says it all “Helen’s Big World,”which is rich, full of life and not limited in any way. This is an excellent introduction for young readers to learn about this most remarkable woman. Doreen Rappaport beautifully captures the essence of this very inspirational child and woman, Helen Keller. It is written in prose with quotes from Helen woven into the story on every page. The book not only chronicles the story of Helen’s challenging and courageous life, but shows children how one can move beyond physical limitations, find their own gifts and change the world for the better. The book is large and Matt Tavares’ illustrations are bold, colorful, emotional and lively. The illustrator emphasizes what Helen can do. This book is a feast for the soul. Adults will also enjoy reading this treasure. I love that the book title is also printed in braille on the front cover. Resources: The book alone is a great resource. There are back pages of resources and materials, as well as a page of the manual alphabet chart Annie Sullivan used with Helen. The American Foundation for the Blind has great resources or kids and teachers, especially if you scroll down and click on the Braille Bug link. Check out author Doreen Rappaport’s website. This is an excellent book for the classroom. Opening/Synopsis: “Davey looked like every other new kid that ever came into our class. Ms. Madison walked him in and said, ‘Boys and girls, this is Davey.’ He was medium height. He had medium brown hair and medium brown eyes. A regular kid.” When Davey asks the teacher if he can look around, he walks around the room touching the book-case, blackboard and his desk. Davey is blind. The students realize that Davey is very resourceful and can do just about everything the others do. All of the kids try to be helpful and offer to do things for Davey. His response is always “Thanks, but no thanks.” When they play kickball, things escalate a bit and no one wants him on their team. Why I like this book: Based on a true story, Genevieve Petrillo has created a heartfelt story about how students respond to a blind student. Lea Lyon’s illustrations are colorful, expressive and full of action. Once again she uses students from a visually impaired classroom to act out scenes for her sketches. Davey is determined to be self-reliant. He doesn’t want anyone doing anything for him. He wants the kids to see what he can do. When he has difficulty playing kickball and still refuses help, the kids are frustrated. But together they begin to observe Davey, recognize what he can do, and figure out how to help him in an unusual and respectful way. Resources: Click on Reach and Teach for special classroom activities designed especially to go with Keep Your Ear on the Ball. There is more information about the real Davey. Just a reminder for May 7: I will be interviewing NYT bestselling author Kristin Hannah about her new book Home Front. There will be a book giveaway. Her interview will launch my focus on Military Families in May.